One of my most treasured items is something I never thought to ever see.I met Susan Nunes online years ago. We learned that we shared the same de Braga ancestry and began comparing notes, photographs, and documents. Susan had something in her possession that I thought was long ago lost. 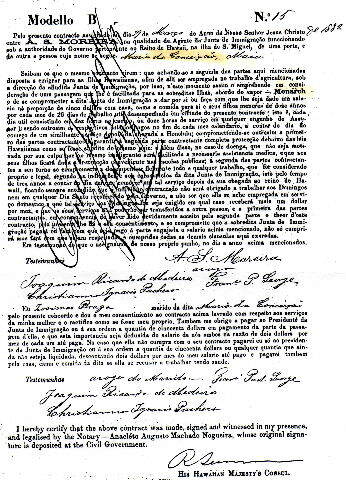 It was a copy of my Great Great Grandparents, Jozimas de Braga and Maria da Conceicao de Mello’s Sugar Plantation Contracts. Unless you do research in Hawaii, you don’t know how rare it is to find a sugar plantation contract. The contract was signed before an individual left their homeland. In my Great Great Grandparent’s case, that was the Azores Islands. They kept that contract with them at all times. It was proof that they were working for a sugar plantation legally. Once the terms of the contract had been met, the sugar plantation representative signed it and dated it. That showed that the person listed on the contract and completed the terms within. They were released from the contract and could then go work wherever they chose. While sugar plantations may have had copies of these documents, they were not kept. Those that survive today are small in number and are usually in the possession of a descendant of the laborer. Though the contract doesn’t really tell me anything new about my ancestors, it helps me imagine the life they lead and the decisions they made. For instance, both Jozimas and Maria were under contract. That tells me they were probably very poor. Most likely peasants. The family needed both parents to work in order to survive. Can you imagine hearing about this far off land called Hawaii that had the promise of jobs and education for your children and deciding to pick up roots, leave your family behind, board a ship, and break all ties with the past? My ancestors hadn’t even heard of Hawaii before they signed their contracts. Life must have been pretty harsh back on Sao Miguel Island for them to take such a risk. You can understand why finding a contract would be very rare. My ancestors carried them with them from the Azores Islands to Kauai, Hawaii in 1882. They moved around the island to various plantations. Around 1906, they moved to Oakland, California. Later they moved to Spreckels, California, and then back to Oakland around 1920. The document was then passed down three generations and finally to me. The documents have seen more places than I have! These contracts is very special to me. Every time I look at it, I am reminded of the sacrifices my ancestors made. And, I thank my cousin for holding on to the document and sharing it with me. Wow, what a treasure! I’ve never seen sugar contracts. Thanks for sharing these documents. Wow! I never knew these existed. My father was the manager of a Sugar Plantation Store when I was a child. We lived in Pauhau on the Big Island (I was born in Hilo) and I can still remember living there and going to the store! So, we’re “kinda kin” or “kin under the skin” aren’t we? My husband’s German great-grandparents also came to Kauai under contract. Well, I am fairly sure they were under contract. I don’t have documentation to prove it, oh, would that be “sweet”! I believe the family worked on what would become the Grove Plantation. They also moved on to Oakland California in 1904. From there they moved on to Michigan.